LILONGWE, Malawi, March 12, 2015 (ENS) – Tens of thousands of elephants are killed each year by wildlife criminals for their ivory. Kenya commemorated World Wildlife Day on March 3 with a symbolic torching of 15 tonnes of ivory to destroy its economic value to poachers. Malawi could be next. Over 7,000 signatures have been collected in support of Malawi’s crackdown on the ivory trade, and the world is watching to see what Malawi will do. World Wildlife Day was celebrated around the world on March 3, and events continued all last week, but due to the clash with Martyrs’ Day celebrations in Malawi it has been postponed until March 18. Malawi has launched a National Elephant Action Plan, led by the Department of National Parks and Wildlife, DNPW, with technical support from Stop Ivory, the Wildlife Conservation Society, the Royal Society for the Prevention of Cruelty to Animals and Lilongwe Wildlife Trust. A recent announcement by the Elephant Protection Initiative, a new global funding partnership, confirmed Malawi’s completion of an ivory inventory and the government’s intention to burn its ivory stockpiles. 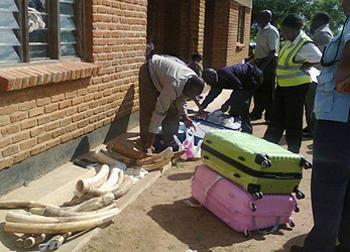 DNPW Director Brighton Kumchedwa, who attended the 2014 International Wildlife Trafficking Conference in London to help curb wildlife crime, said the agency is formulating a response plan following these talks. The London declaration contains commitments for practical steps to end illegal trade in rhino horn, tiger parts and elephant tusks that fuels criminal activity worth over US$19 billion annually. It called for measures to eradicate markets for illegal wildlife products, ensure effective legal deterrents, strengthen law enforcement, and support sustainable livelihoods. 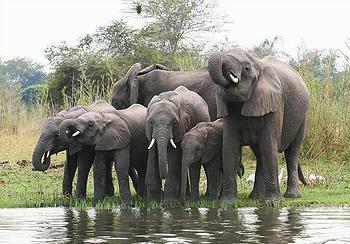 Kumchedwa said poaching has reduced Kasungu National Park’s elephants population from 2,000 in the 1980s to an estimated 58 animals today, according to the Elephant Database – devastating statistics from a conservation perspective. Last February Malawi joined scores of other countries in a declaration to crack down on wildlife crime. Since then significant progress has been made. 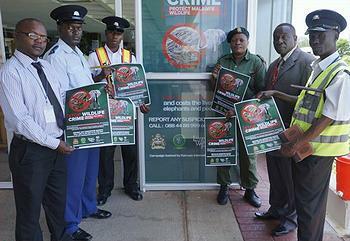 A ‘Stop Wildlife Crime’ public awareness campaign has been launched, an inter-agency committee to combat wildlife crime has been established and a moratorium on domestic ivory trade has been imposed. The government has undertaken a review of the national wildlife policy and wildlife legislation and an illegal wildlife trade assessment in accordance with the United Nations Office on Drugs and Crime toolkit on combating wildlife and forest crime. Due to public pressure as well as local and international synergies among enforcement institutions, the judicial system is now treating wildlife offenses as serious crimes. Culprits are being fined record high amounts, up to MK1 million (US$2,340). Offenders in default have no choice but to serve their sentences in jail. Dickson Mzinda, for example, recently was convicted of hunting protected species and possession of firearms and ammunition. In his ruling, Lilongwe Senior Resident Magistrate Paul Chiotcha said in his judgment that the sentence must fit the crime and the convict, be fair to society and also have a face of mercy towards the offender. “I am convinced that he is a person who cannot be trusted with his liberty. If released it’s clear he will continue to commit these kinds of offenses,” said Magistrate Chiotcha, who sentenced Mzinda to a total of four years, 10 months of prison with hard labor. Chiotcha’s ruling was welcomed by conservationists who attended the trial. Twambilire Sichali, Deputy Manager of Malawi Revenue’s Fast Anti-Smuggling Team, participates in the inter-agency task force meetings. Sichali called for frequent updates from the Department of National Parks and Wildlife on the progress they are making in prosecuting offenders netted through coordination and information sharing. She said such updates will strengthen morale throughout the Customs Enforcement Network, which helps clamp down on illicit goods trading, including ivory.